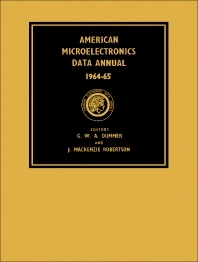 American Microelectronics Data Annual 1964-65 provides comprehensive information on different microelectronics available in the U.S. The microelectronics covered in the text includes thin film, semiconductor, and integrated and hybrid circuit assemblies. The selection also provides an index that can be utilized for locating assemblies by the virtue of circuit function or design category. Information on the techniques essential in the practice of microelectronics is also included. The book will be of great use to student and professional electronics engineers and technicians.